Spring is practically knocking on our doors here in London and entering into my kitchen. I’ve been away the last couple of weeks with work and while I am lucky to eat out at some lovely restaurants, after a few days I do start to crave home cooking and my kitchen. Its taken me a few days to get over my jet lag and my body is just craving fresh fish and seafood. Some of the best seafood I’ve ever eaten has been in on my annual summer trips to Puglia. So I headed down to a local fishmonger and I bought some lovely fresh squid for dinner. 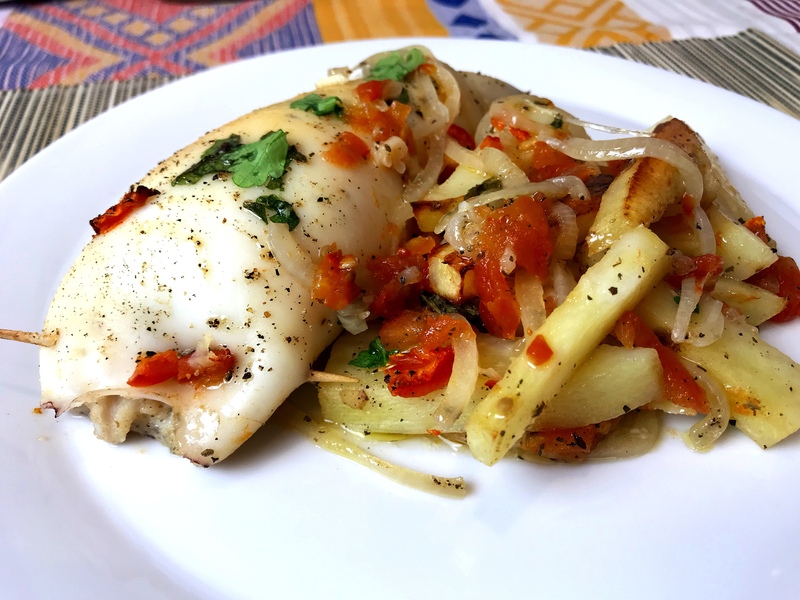 This recipe of baked stuffed squid with potatoes and tomatoes is a) delicious b) brings the essence of summer Puglian cooking into your home without getting on a plane and c) its simple and quick. Perfect for London living. Make the stuffing, by putting all the ingredients into a bowl & mix together. Stuff the cavities of the squid with the mixture & secure with a toothpick. In an oven dish, drizzle olive oil to coat the bottom. Layer the garlic, onion, half the tomatoes and parsley. Season with salt. Lay the squid on top, and arrange the potato around the edges & add the remaining tomato & parsley. Season & bake for 40 mins until potato are tender.